Carmella smashing a cake into Elle's face. Hurrah! Isabelle begging Pete Gartside for a face to face meeting to talk about what's happened to her. Julian Clary stands nonchalantly behind her. Paul scrambling on a cliff face; Dylan takes his hand. Boo. Karl and Susan turning up at the Ritz Hostel. It reeks of something. Ned suggesting he and Elle run away to escape from Paul before they end up like him. Please do. Elle is on the phone telling Ned that running away was a stupid suggestion – she's on the verge of having it all. There's a knock at the door and it's Oliver, who is furious at Carmella for what she did about the cake. He thinks Carmy was acting like a spoilt brat. Elle sticks up for Carmella, saying that she liked Oliver a lot, and sees Elle as someone who's in the way of that. Well, der. Oliver thinks he's better off with someone like Elle in his life. She thanks him for the compliment, but she needs some ‘me time' so ushers him out the door, quite literally. She sighs and wanders upstairs. Shot of Tower Bridge, open. Not really close to Blackfriars, but it establishes we're in London, I suppose. Although I think the thick winter coats do that pretty well, too. Izzy stands riverside, with the no-longer-wobbly Millennium Bridge in shot. Pete wanders up to her. She tells him that she's put a hot bikini on hold, and is looking forward to going to Croatia, and understands if he wants to wait til the season's over. He reaches into his pocket and pulls out a cheque for her to give her the life she deserves – for the princely sum of £250K. She can't believe that he's buying her off after what they agreed, but he tells her that three of his sponsors have dropped him and his wife is fighting dirty with the Press. Isabelle tells him to ride it out – the tabloids will forget it soon. She realises that he's scared and he's going out of town for a few weeks with his wife, Alicia. He says goodbye to her and Izzy is gutted. 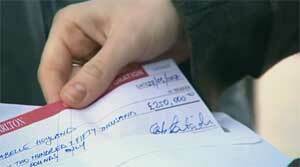 She screws up the cheque. Frazer is laughing at Oliver's story, thinking they're both mad to date Cammenitis. Rosie strops in with Pepper, furious with Oliver because her sister is at their mother's house, crying her eyes out over how he treated her. Pepper also saw Oliver kissing Elle, and told Carmella. Frazer thinks Oliver owes Carmella nothing, which immediately raises Rosetta's hackles. ROSETTA: What's that supposed to mean? Rosie slaps Frazer, hard. Ooh – 3110 flashback. Oliver suggests that they leave, and before they do, Frazer tells Rosie that just because she and her sister are incapable of happiness, they don't have to drag everyone else down with them. Rosie is left with that stinging retort in her ears. Rachel and Zeke are cooking. Well, Rachel is cooking and Zeke is criticising. It's all been overcooked, and Zeke wants takeaway instead. The oven smokes loudly and the smoke alarm goes off. Rachel goes to the door and starts flapping it in the hope that it will air the room a little, yelling to Zeke that it's important that they eat properly whilst their parents are away – they can't have takeaway every night. Toadie emerges from his room wondering what's going on. Zeke wants to know what they tell Karl and Susan about Stingray when they call later. As if by magic, the phone rings, and it's Susie-doll, calling from the streets of London. They're paved with gold, you know. Toadie asks Susan how things are and then puts her onto speakerphone, joking that they're drinking underage and having a party. Zeke says hi to Susan – who can't believe there's no news – before making an excuse that he has homework to do and rushes off. Susan asks Rachel how she is, whilst Karl follows her, bag in tow. Rachel says she misses them, and Susan misses her back. Toadie makes a quick excuse to put the phone down. Gratuitous red London Bus shot. Paul fumbles with the keys to get into number 22, and realises that his hands are covered in scratches. Elle is waiting up, wondering where he's been and why he hasn't called her earlier; she was worried. Paul asks after her and Oliver, but Elle wants to forget about it. She declares that she's reeling him in, slowly. But there's obviously a problem and she doesn't want to talk to her dad about it. He gives her a hug, saying they'll get through it. Quite what, I'm not sure. Frazer and Oliver sit at a table, gloomily. Frazer asks after Elle, and Oliver thinks she and he have potential. Milly walks into the bar and Frazer hides. He doesn't want another slapping today. OLIVER: I thought you liked her? FRAZER: (deadpanning) Yeah but then I accused her of stealing and it kind of all went downhill from there. Frazer tells his brother he's already tried to apologise to Milly who was having none of it, but decides to try again. He approaches Milly and apologises again for letting himself be swayed by his immature, lawyer housemate. And for once we're not talking about Toadie. Milly gives him another chance, and orders drinks for him and the ‘perfect ten in the black dress'. Pep and Rosie turn up so he orders them a cup of warm milk. Rosetta tells him to get over himself, so her turns to her. FRAZER: You know, that slap in the face was like a real……slap in the face. You punish people because you're miserable. PEPPER: No. She's not miserable. You are. In fact, both of you are. FRAZER: No, we're not miserable. We've got social lives. What are you two doing tonight? Oh no, let me guess: cheap plonk, chocolate and that stupid Heath Ledger DVD. OLIVER: You guys are *so* transparent. PEPPER: We've actually got something massive planned. And you know what? Both of you aren't invited! Oliver and Frazer present their backs to the girls with precision timing. The girls walk to the bar. ROSIE: Oh, look, if they can't appreciate Ten Things I Hate About You, it's their problem. PEPPER: DVD night is off. ROSIE: It's based on Shakespeare. PEPPER: They think they're so superior. It's time to fight fire with fire. A party is going on. Rosetta tells two guests who are making smoothies to clean up after themselves. Wow, this girl knows how to party. She tells another guest to use a plastic cup. Pepper shows up. ROSIE: You've been kissing Paul Robinson, haven't you? PEPPER: Define kissing. (pause) Don't be mad! ROSIE: I'm not mad, I'm appalled. I think you're a masochistic idiot with no self-esteem. PEPPER: But you still like me, right? Rosie and Pepper go into the lounge and Rosie isn't having a good time – she doesn't recognise anyone and it's a bit rowdy for her. Oliver and Frazer return home with Milly, and aren't too pleased to find a party going on. Pepper tells him they're having a social life. Frazer runs to the lounge on hearing a fashion parade going on with his suits. Milly approaches Rosie and tells her that Frazer was right – she *is* immature. Susie is picking out postcards from a propped up postcard stand. Karl is reading his guide book next to a newspaper stand. 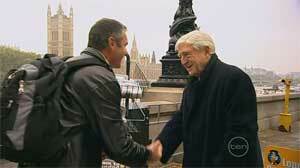 Michael Parkinson walks up behind him to get a paper and Karl is *delighted* to see him! KARL: Can I just say, I think you're *fabulous*! I never miss your show! KARL: Can I…can I call you Parky?! PARKY: Yeah, if you want to. And you are? KARL: That's right, yes. Yes. Erinsborough! Your interviews, they're just absolutely inspired. He asks him for an autograph. Parky sees Pete Gartside's autograph and says he wouldn't mind chatting to him – or his Aussie bit on the side, either! Can Karl fix it for him?! Karl awkwardly laughs and says it's a big country, he can't say he's met her…! Parky walks off, telling Karl to give his regards to Dame Edna. Susan comes back from the shop, having bought postcards. Karl tells her he met Parky and she doesn't know who he's talking about at first…and then is gutted – she loves him! She loves him! Karl picks up a paper with Isabelle on the front. He wants to know what's going on. SUSAN: Isabelle is involved in a tawdry relationship with a married man. It's ended in disaster…it's hardly news!! KARL: I can't believe we have come seventeen thousand kilometres from home and she is here! SUSAN: Well she's not stalking us, Karl. She obviously lives here now. Paul didn't realise that Elle was fighting with Carmella, but she points out that stealing her boyfriend didn't help their friendship. There's a knock at the door and it's Oliver. Elle tells him that she's busy and can't see him now, but Paul invites Oliver in, anyway, and he asks to use the bathroom as someone's passed out in theirs. Paul isn't happy that Elle was trying to push Oliver away, so she admits that she wants out. She doesn't want to fool someone as genuine as Oliver. She thinks that her dad encouraging her to live her life like that is wrong. Paul tells his daughter that he nearly died yesterday – Dylan pushed him off a cliff. He doesn't ever want anyone taking advantage of either of them ever again, or catching them off guard, which is why they have to stay focused. But if they didn't treat people like that in the first place, surely there's no need to worry about people nearly killing them??? They're *causing* the problem. PEPPER: We're going for a swim. I would invite you but I can't. I'm Rosie's friend. Milly goes back to the bedroom and Frazer to the kitchen, where Rosie is sitting with breakfast. He needs a taxi number as Bessie is playing up again. Rosie offers to take him to the race track – she's going that way anyway to do Carmella's fruit & veg run. She apologises for hitting him. He apologises for provoking her. Oh just kiss already. Isabelle quietly tells Susan that she and Peter love each other, and they've been together a long time. Well, a long time for her. She says that Pete's wife doesn't like him, she's been cheating on him for years. Susan suggests that Isabelle tell her side of the story to the Press, but Izzy can't do that – he's in a difficult position. ISABELLE: You know, I thought you'd run a mile when you saw me. SUSAN: I wanted to. Could only manage a fast walk. Isabelle tears up and says that it's really good to see a familiar face. Susan puts her hand on her shoulder to comfort her, and tells her that there might be paparazzi lurking. Isabelle agrees – and imagine the headlines if Susan doesn't take her hand from her shoulder! Karl approaches, reading the paper and oblivious of Isabelle's presence. He thinks the Izzy stuff is dynamite – then sees her. Shocked and not happy to see her, Izzy tells him that he shouldn't believe everything he reads. He sees that she's pregnant – so her not being able to conceive was another lie, was it? Susan drags Karl off to one side, insisting that Isabelle's in some kind of trouble. Karl asks if they know who the father is. Rather tellingly, Susan drops her eyes and refuses to look at Karl, stuttering that it's some guys at Lassiters. Yeah, Susan, sure you believe that. Susan insists that they have to help her – she's eight months pregnant and on her own. Toadie's on the phone to Steph telling her that Stingray's gone, and he's fine about it. Rachel and Zeke are eating breakfast at the dining table. He puts the phone down quickly to her. He sits on the sofa and Rachel and Zeke go to sit beside him. TOADIE: Guys, I've already told you I'm fine, I've moved on. So case closed. RACH: But Toadie – you haven't dressed. You haven't even showered. Zeke gets upset. Toadie starts to cry, asking Zeke not to do that because then he'll get upset too… Rachel is crying, and Zeke insists that when someone you love has gone, you have to cry about it. I guess he should know. Toadie thinks there are other ways of dealing with things, but that doesn't hold true for too long as he breaks down with the Kinski kids beside him and in a long shot of the house we see them sitting on the sofa, alone. Rosie and Frazer are at the race track, and there are horses riding by. Funny that. A little girl walks her dog behind them, and a couple stand taking pictures. Rosie thinks she has to get on with her fruit run, but before she goes she asks Frazer not to talk about her with Milly. Frazer comments that she talks about him with Pepper. Rosetta defends herself – it's different because Pepper's a friend. Like Frazer speaks with Oliver about her. FRAZER: Why do we do this every time? ROSIE: Because we hate each other, obviously. The dog runs onto the track and the little girl, Jemma, follows it. Frazer turns to see the horses running round again and shouting ‘no' he leaps over the fence and onto the track. FRAZER: Get off the track! Go! GO! The little girl runs off, and Rosie screams at Frazer, who turns and is knocked down by the horses and it's Drew and Libby all over again.